Our Brothers from the Ronald J. 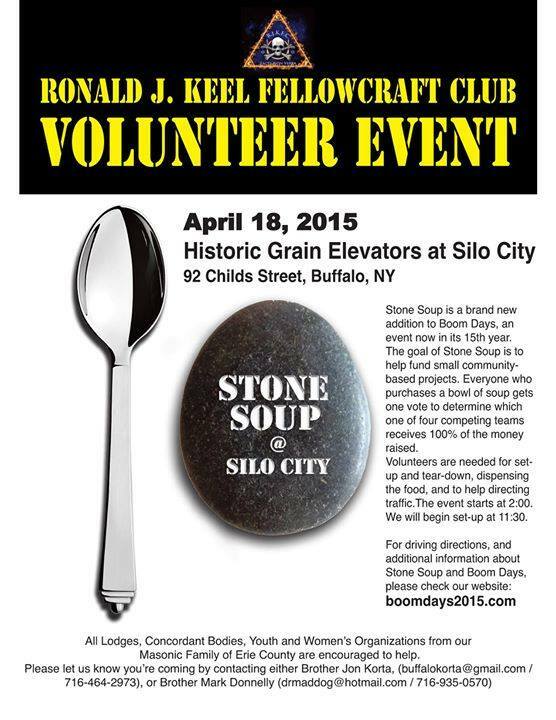 Keel Fellowcraft Club are hosting a Stone Soup Volunteer Event April 18, 2015 at the Historic Grain Elevators at Silo City. “All Lodges, Concordant Bodies, Youth and Women’s Organizations from our Masoic Family of Erie County are encouraged to help” – And join in with the fun! Please see the below flyer for additional information. If you want to volunteer please contact Bro. John, or Bro. Mark on the flyer or fill out the below form.